Joseph Ratzinger was ordained a priest on 29 June 1951, the Feast of Saints Peter and Paul. 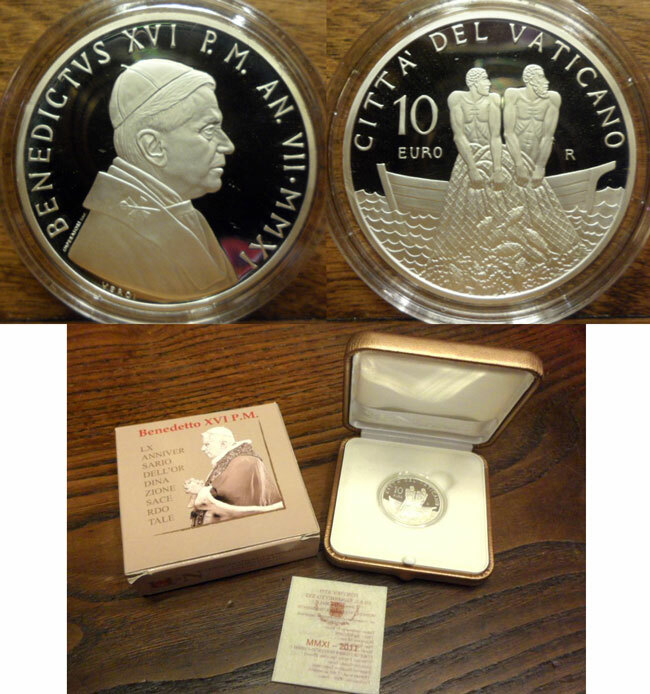 This 10 Euro silver coin celebrates the 60th anniversary of that fundamental day in his life of faith. The reverse depicts the Apostles Peter and Andrew while fishing at the Sea of Galilee. Both are looking right at the moment Jesus calls them saying, "I will make you fishers of men". The representation captures the key moment of the call and vocation to the priesthood. Includes original plush case and certificate. By artist Guido Veroi, a sculptor who has authored numerous numismatic works for the Vatican and other countries. Mintage of only 7,998.